While dual-branding a hotel is not new, its popularity among developers has definitely taken off in the last few years. Today there are fewer than 100 dual-branded hotels in the United States. Based on data collected from Hotel Market Data, there are currently 46 dual-branded hotels under construction in the US, with another 41 in the planning stages that will likely begin construction within the next 12 months. Dual-branded hotels, also known as two-in- one hotels, are simply two branded hotels generally in a single structure run by the same operator. However, the choices faced by developers and operators can be anything but simple. The two brands that comprise the hotel can be either “linked” or “blended.” Linking occurs when the properties share minimal components (limited to areas such as parking, swimming pool, fitness area, or back-of- house operations). Blending results in further integration, such as combined breakfast areas, lobbies, front desks and hotel staff. The advantages to an investor or developer with a dual-branded hotel is the likelihood of significant cost savings when only having to develop a single amenity or component within the hotel. The saving can even begin prior to construction with decreased costs related to plans, permits, fees and entitlements. For these reasons, developers generally prefer to do as much blending as possible. However, because these properties are usually the opposite of prototypical construction, additional costs can accumulate when significant specialized design, development and construction are required. Regardless of the level of savings during development, long-term cost savings can be realized by the operator when they are able to combine management, facilities, sales and administrative offices. The primary drawbacks to dual branding are more likely to be expressed by the franchisor, or even some guests. Brands invest significant time and money to create a strong brand identity, which in the best case scenario leads to strong brand loyalty in their customers. 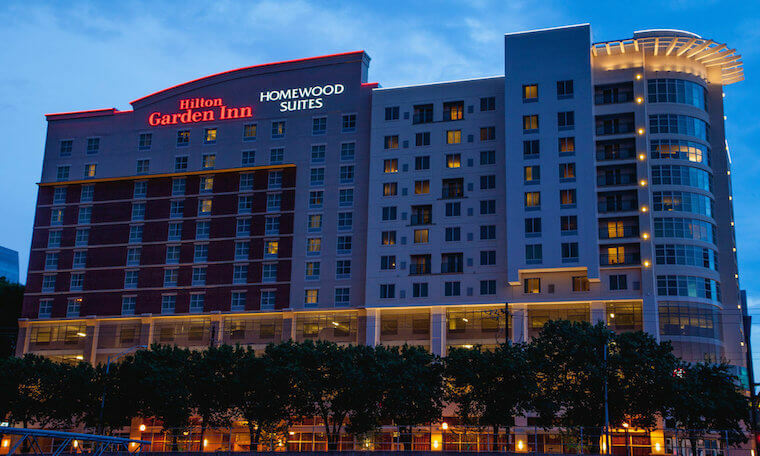 A customer who seeks out a Hilton Garden Inn, for example, may be disappointed if they do not encounter the customary Pavilion, but instead are greeted by the Homewood Suites Lodge motif. For this reason, Hilton generally requires separate entrances and lobbies for their dual-brand hotels. Furthermore, when one of the two brands is at a higher price tier, the hotel runs the risk of alienating guest if they attempt to “over-police” the amenities by restricting access for certain guests to specific areas of the hotel. This is especially an issue when only one of the two brands offers a free breakfast. On the other hand, dual branding does give franchisors the unique opportunity to pair an older, established brand with a newer entry to the market. For instance, combining an AC with an established Marriott brand, or a Canopy with an established Hilton brand can lower risk while increasing exposure to future guests who are less familiar with the new brand. These last couple of points hint at one of the other biggest questions that developers have to grapple with in the early stages of planning and development of a dual brand hotel. Which two brands will complement each other at the proposed property? In the vast majority of cases, the two brands will be from the same brand family, although there are some very notable properties that defy this rule. The most prominent example of this is the 664-room, tri-branded Hyatt Place, Fairfield Inn by Marriott, and aloft by Starwood that was recently developed in Chicago by White Lodging. Assuming there are just two brands, the developer still needs to determine if the market will be more receptive to a property that combines two brands of the same market class (midscale, upscale, etc.) but is oriented towards different market segments (extended stay, leisure, etc.). One example of this is to combine an upscale, extended-stay with an upscale, lifestyle hotel such as the proposed Staybridge Suites/EVEN Hotel set to open in Seattle in 2017. This blended IHG property will have the benefit that guests will feel more comfortable utilizing the shared space, but it assumes that the market can absorb a larger increase in upscale room supply. The other option is to combine two brands that are competing for an overlapping segment (business traveler) but combine different market classes (economy and midscale). An example of this is the older, linked Choice property by the Portland Airport, where a developer combined a Rodeway Inn and Quality Inn. While this combination is more likely to lead to conflicts between guests paying differing amounts for overlapping amenities, it does allow the owner to maximize its market penetration by being attractive to a larger percentage of the market. As an additional bonus, this setup allows the owner to “lock up the competition,” all on the same site, preventing a competing hotel from opening down the street. The developer of this specific Rodeway Inn/Quality Inn was happy enough with how this property performed, that he is seriously considering converting another recent acquisition in SeaTac to a similar dual-branded property. It is interesting to point out that Marriott and Starwood are two of the five most active hotel companies in the dual-brand area, with Marriott being the most active of all brands. With their recent merger, the potential combination of brands has just increased. As can be seen, there are a number of questions that a developer faces when considering developing a dual-branded property. The underlying current is that for the property to be maximally productive, the assistance of an experienced consultant early on who fully understands the market can be invaluable. This will especially be the case going forward, as the number of dual-branded hotels will likely continue to increase.